UK-built steam engine Cumbria busily works on a fine holiday in May in the lush surroundings in the Rainbow Country. 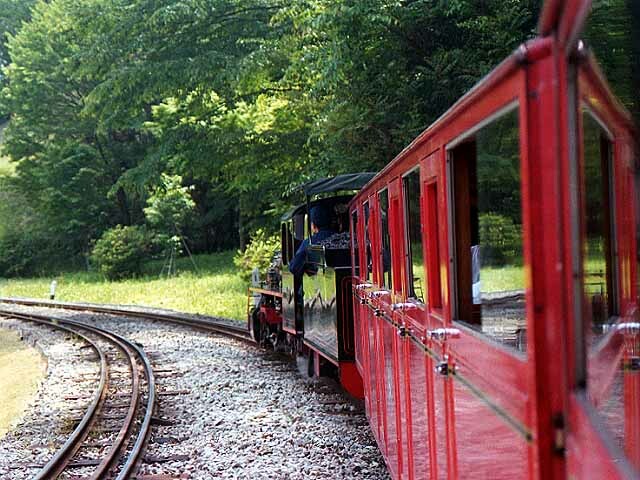 In a flower park located fairly off the beaten path on Izu peninsula in Shizuoka prefecture, a 15-inch (381 mm) gauge railway operates with interesting miniature steam trains. This is Niji-no-sato (Rainbow Country) that offers six parks in a vast area, comprising a British Village, a Canadian Village, Craftsmen's Village, a Fairy Village, an Izu Village and a Japanese Garden, where one can enjoy various seasonal flowers through the year. 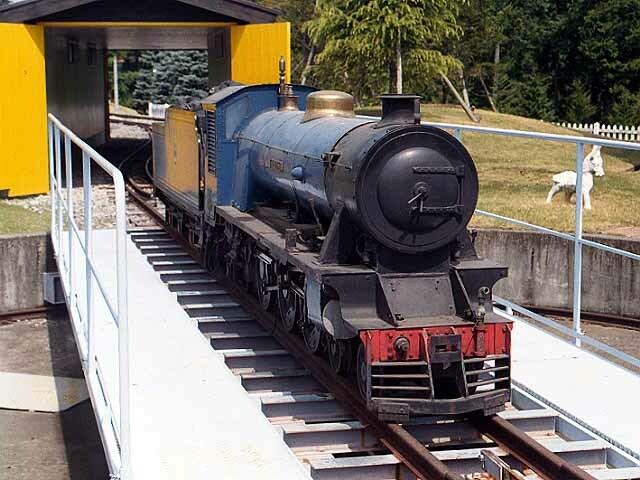 The 15-inch railway constructed as a transportation means linking the British Village and Canadian Village is the Shuzenji Romney Railway, modeled after the Romney, Hythe and Dymchurch Railway in the UK, which runs along the sea coast of the Dover Channel. Locomotives, coaches, tracks and station facilities are miniature in size, but everything is as real as a regular heavy railway in one-third full size. Steam engines, of course, operate burning real coal. 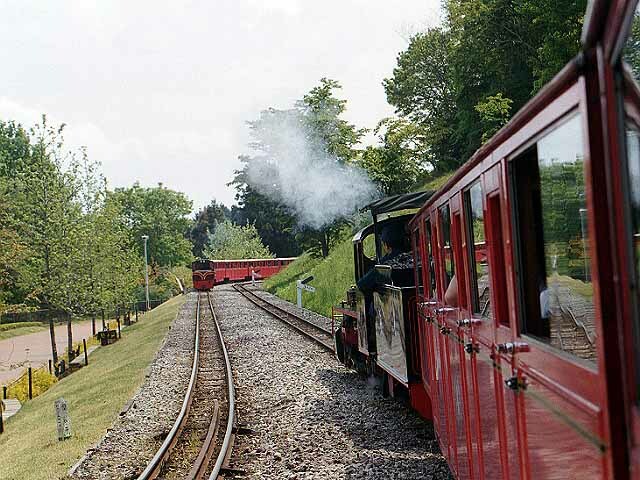 The fleet of the railway consists of UK-built miniature steam engines and diesel engines, along with miniature coaches. The oldest steam engine is 1949 built Ernest W. Twining. Unfortunately, this engine is not regularly used for train operation, because it is small in size and not powerful enough to pull a train. Regularly used for steam haulage are Northern Rock II and Cumbria, built in 1989 and 1992, respectively. Either engine daily operates steam trains during busy seasons, showing off its beautiful green livery. The coaches in service feature authentic British miniature train practice, with compartment doors which can be opened from the outside only. The railway consists of approximately 1.2 km of trackage connecting Romney station in the British Village and Nelson station in the Canadian Village. The operations are endless through the use of a double-track main route with end loops. The stations are located on these loops. The landscape around the line is beautiful and full of green because of the favorable location of the park in mountainous surroundings. 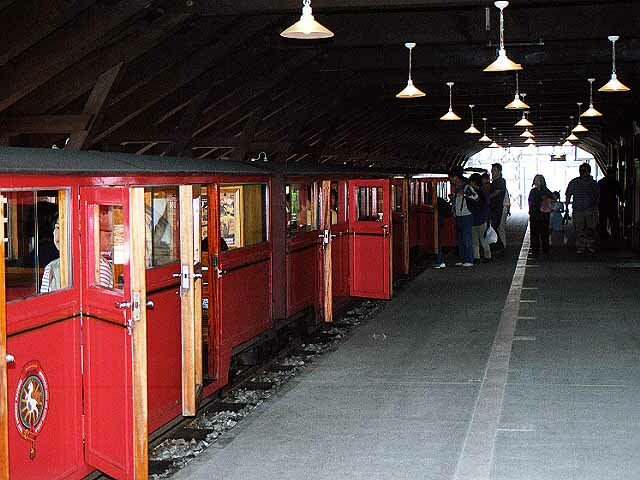 Exotic ambience is provided for domestic visitors by a row of European style houses at around both stations. On the platform of both stations, the station master along with other station employees in their genuine railway uniforms take care of closing and opening train doors, and see you off upon the departure of your train. On a run, the train slowly rolls, much slower compared to the 15-inch railways in the UK, with light sounds of rail joints specific to a miniature train. 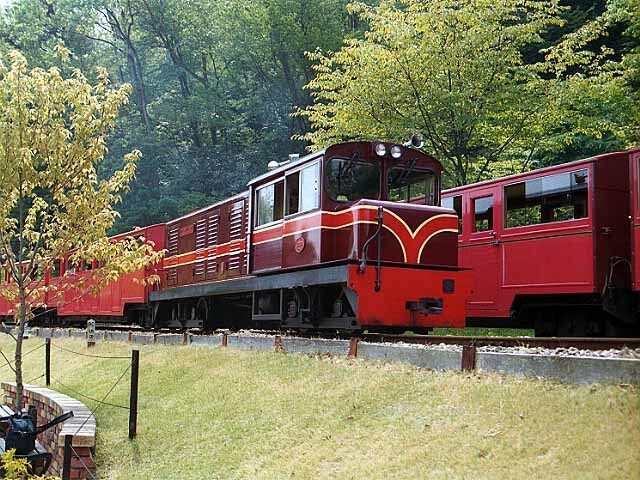 Another rail-related attraction is a museum located adjacent to the miniature train shed. Closely situated just inside the museum entrance are the spur tracks of the shed. There, you can see miniature locomotives not in service on the day on hand. Specially preserved in the shed is a miniature Japanese steam engine modeled after C11 328, a 2-6-4 tank, which is the only Japanese steam locomotive on 15-inch gauge. Inside the museum are an HO scale layout, video shows, and some model trains of domestic and British railways in show cases. An assortment of old British rail service posters on the wall is very interesting. 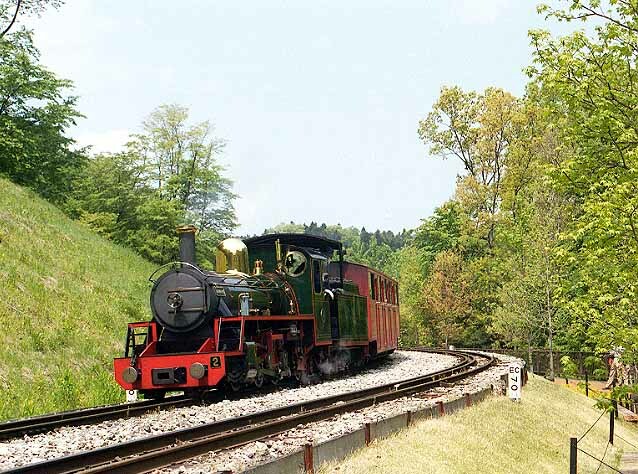 Spending one day in the park must be a good idea for a family group for not only enjoying steam train rides but also for picnicking in the superb outdoor location with rich greenery of lawns and surrounding trees. Visiting the Craftsmen's Village will offer you great opportunities to learn old Japanese culture at various craft workshops, with pottery, bamboo ware, Japanese paper work, Edo embroidery and so on. The Fairy Village will put you in mind of a Western flower garden in harmony with beautiful fountains and rose beds. In the Japanese Garden, you can enjoy flowers of each season with alpine roses, hydrangeas, daffodils, sweet flags, etc., all well maintained in beautiful flower beds and woods. In the Izu Village, various Izu specialties are available at shops, folk-art objects, mushrooms, sweets, tea and so on. There are a number of restaurants and tea rooms in each Village or Garden. The location of Niji-no-Sato is at the top of Izu Peninsula in Shuzenji, an administrative town, well known for a historic temple (Shuzenji: Shuzen Temple, actually the town was literally named after this temple) and a hot spring resort developed along the Shuzenji River, a tributary of the Kano River, which flows northwards into Suruga Bay through Numazu city, gathering ample water from forested areas in the peninsula. Shuzenji is about 25 km from JR Mishima station on the Tokaido Main Line. The Izu-Hakone Railway connects Mishima and Shuzenji with an EMU service, with 15 to 20 minutes frequencies. From Shuzenji, bus service provides pretty good connections to Niji-no-Sato, every 20 minutes in frequency and taking 10 minutes for the ride. JR's Izu-Hakone through limited express service is available from Tokyo. This service, Odoriko (Dancer in English) leaving at 9:00 and 10:00 in the morning, conveniently takes you to Shuzenji in Izu peninsula with a two hour and seven minutes train ride. On a fine holiday, it is better to visit the park than on a quiet day. Train operation is increased on busy days, every 15 minutes in frequency from both stations, in contrast to every 30 minutes on a less crowded day. Two trains, probably one is steam and the other is diesel hauled, meet en route between the two stations on the double-track segment, and you get better oppotunities to photograph the lovely trains. 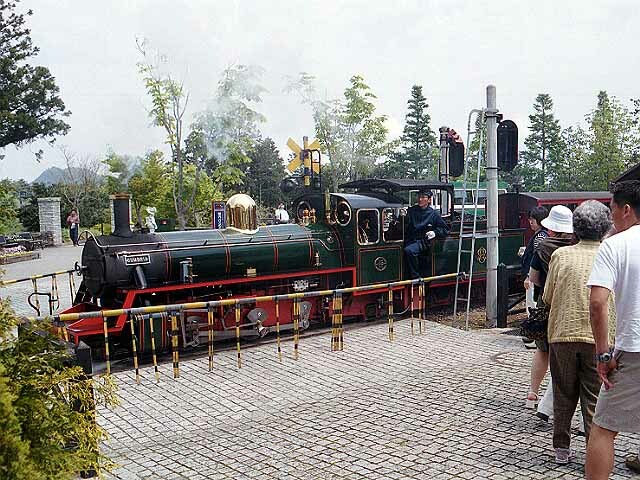 Visiting the park on a rainy day is not recommended if you want to ride or photograph the miniature steam trains, as although trains are operated even if it rains, the service is all diesel haulage, because of the existence of a gradient on the line, which is hard for the miniature steam engines to climb up in slippery conditions. 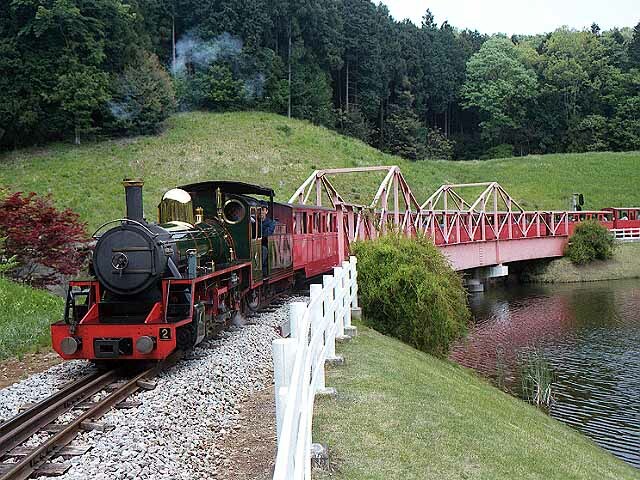 If you are interested in the Izu-Shuzenji version of British 15-inch steam trains, try to stop by the park one day during your stay in Japan. 1949 UK built engine Ernest W. Twining being displayed on a turntable. Unfortunately, this engine is currently dormant because of its low power. Cumbria rolls hauling an up-bound train along the double track main route running adjacent to a wood. Cumbria departing Romney station across a level crossing. Specially featured villages and gardens stretch down far beyond the crossing in woods. Cumbria proceeds along a loop encompassing the Canadian Village, crossing a bridge over a pond. Cumbria stands at Romney station waiting for a departure. On the tender is real coal to generate haulage power. Diesel engine John Southland II powerfully serves a miniature train. 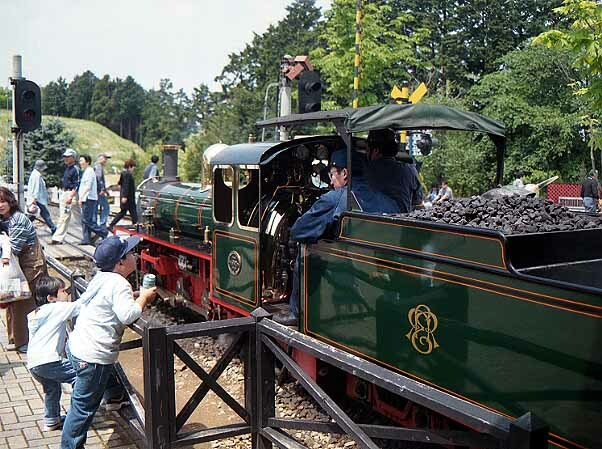 The engine, Bo-Bo, first worked for the Romney, Hythe and Dymchurch Railway before being transferred to the Shuzenji Romney Railway in 1989. An up bound steam train proceeds along the double-tracked main route, meeting a diesel hauled down train en route between the two stations. 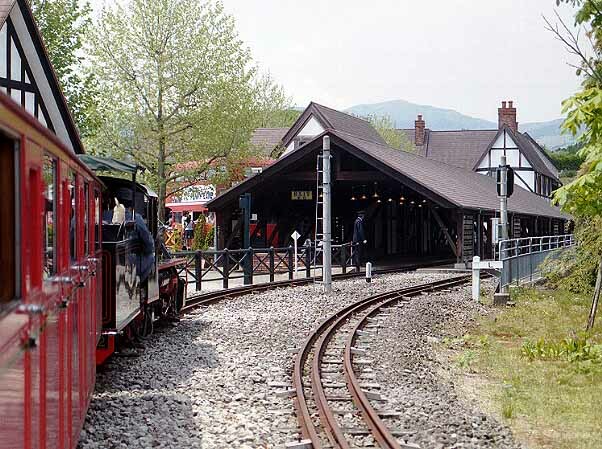 A Cumbria-hauled train returning to Romney station in the British Village. The Canadian Village end loop winds alongside a pond. 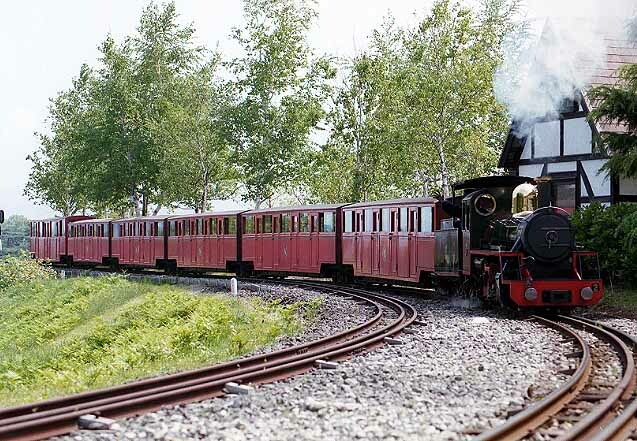 The beautiful landscape along the line is due to the favorable location of the park in mountainous surroundings. A Cumbria-hauled train pulling into Romney station. Inside Romney station. 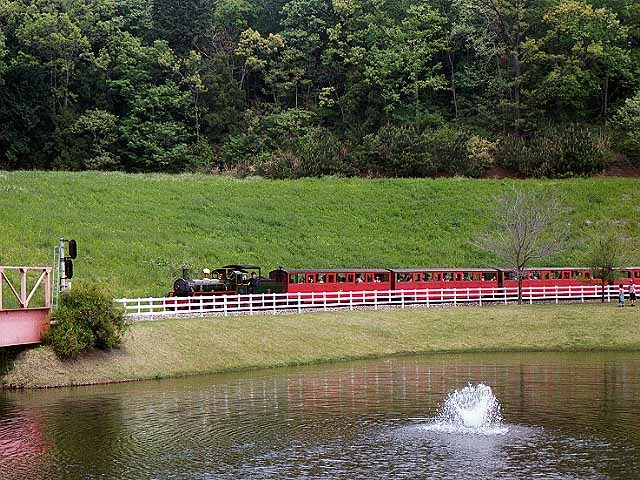 The coaches feature authentic British miniature train practice, with compartment doors which can be opened from the outside only. 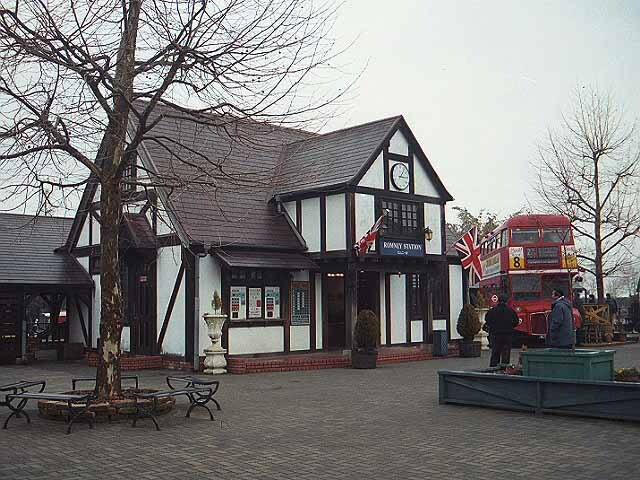 The building of Romney station, associated with a double-deck London bus on display.